New Delhi: Doctors at AIIMS are examining a pair of two-year-old twins joined at the head, and will assess whether surgery can be performed to separate them. The twins — Jagannath and Balram — from Kandhamal district in Odisha, were taken to AIIMS after they were brought here from Bhubaneshwar this afternoon. They are accompanied by their parents and Assistant Manager of National Adolescent Health Programme, Soumya Samantray. Dr A K Mahapatra, chief of neuro sciences centre at AIIMS said the twins will undergo a series of tests such as MRI, CT scan, and angiogram, to see to what extent the veins in their brains are fused and whether surgery is feasible. “They are craniopagus twins, that is who are connected at the head. This is a rare condition. It is very difficult at this stage to say if surgery is feasible to separate them. They will undergo several tests in the next 10-12 days after which we will decide,” Dr Mahapatra said. 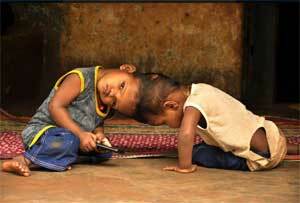 Dr Deepak Gupta, professor of neurosurgery, said the conjoined twins suffer from a rare condition which afflicts one in 30 lakh children, of which 50 per cent die either at birth or within 24 hours. Surgery is feasible only on 25 per cent of the survivors while the rest continue to live with the condition. “Also, there is less than a 20 per cent chance of survival among those who undergo this surgery. Such operations are extremely challenging and doctors from plastic surgery, paediatric surgery, anaesthetists and radiologists, among others, will be involved,” Dr Gupta said. Jagannath and Balram’s parents, who are poor farmers, expressed the hope that doctors would perform the surgery and separate their sons. “We have come all the way from Odisha with a hope that the lives of our children will be transformed after the surgery. The rest is up to god, we human beings can only hope for the best,” their mother said. Railway Minister Suresh Prabhu, who came to know about the twins travelling on the Bhubaneshwar Rajdhani to Delhi, ensured medical facilities for them on board during the journey and also arranged transport to bring them to AIIMS from New Delhi station.